call the different forms thus identified the determinations of causation. if the cause is absent, the effect is invariably absent. which as we shall later see may take various forms. We shall presently see how this model is variously reproduced in lesser determinations. For now, it is important to grasp the underlying principle it reflects. 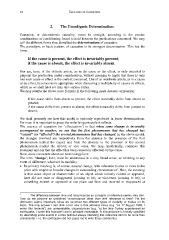 statement and say that the effect has been caused (or effected) by the cause. event of difference, whatever its modality. The difference between time and circumstance as concepts of reference seems very slim. coincidental – i.e. the earthquake did not cause me to write these comments).